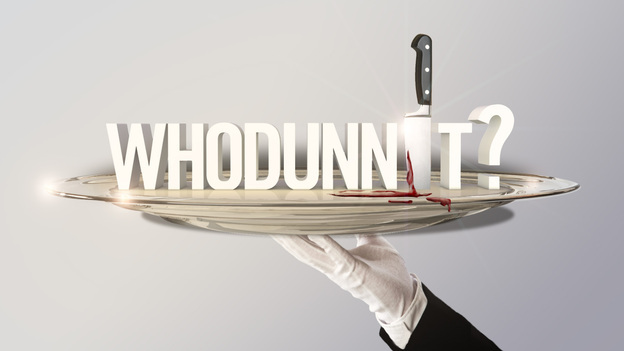 Whodunnit? is a bold experiment in television, but the foundations feel creaky. They also feel low-budget. After this week’s recap, and some deceptive establishing shots, a full minute is spent showing the exact death footage from last episode — rewound obnoxiously far back. Not fleeting shots of Dontae running down the stairs and jumping into the water, but the full scene. The fire alarms ring. Everyone gets out of bed and assembles at the pool. Giles takes a quick head count and wonders where the last two contestants are. Don comes out saying, “I’m here, I’m here!” They wonder where Dontae is, and finally, he comes running down the stairs with zero new angles. It’s one thing to show old footage in the recap, and another to begin the episode with a hurried visual summary. But it’s another to stretch it out so far that we get every dramatic beat in full detail. Are we supposed to be startled again by Dontae’s death? All of this feels like a show either: A) Saving money with recycled footage, or B) Trying to ease new viewers into its second, less confusing episode. With 23 percent less viewers than last week, however, the ratings overlap went backwards. Besides, even return viewers could not be expected to know what’s going on in the Rue Manor, no matter how much footage was repeated. But this strange recycling does not define the rest of the episode. This week, there is more than enough innovation to fill the time slot. What’s more, budget concerns enhance the show by making viewers feel like they’re bound by the rules of disposable reality competition (“It’s just another Survivor clone…”). Well, after our second visit to the mansion, I can tell you one thing (almost) for sure: these are actors and this show is scripted. By the end of the episode, however, the ambience of generic competition was still heavy enough to convince me that everything is proceeding according to plan. Which means that if Giles actually shoots that shotgun he’s holding in next week’s preview clips, I’ll be traumatized because it’s going to feel — on some level — like a deranged man has stepped through the boundaries of a regular show and killed someone. By creating a show that seems fake and cheesy enough to be full of people laughing along with it (or actors overdoing their emotional involvement), Anthony Zuiker has made us — on a gut level — expect everything to be equally weightless. This was a false lead. Giles is now officially a character, and you never know what he’s going to pull out. Literally. In his explanation for the second challenge, Giles strains to read poetry from the back of a white flag that he has to extend his arms completely to keep open (while mansion staff stand around him holding platters of smaller flags). But he’s still able to glance dramatically backwards. Not necessarily going for humor, the scene strikes a note of British farce. At the diner table, later on, Giles sounds like Lane Pryce performing a variation on “Sinners in the Hands of an Angry God,” through the lens of Paul Dano’s preacher from There Will Be Blood. “YOU-LYSSES, CONGRATULATIONS,” he bellows, so loudly that we hear someone gasp in the background. While there have been substantial waves of media desensitization, actual shouting is still rare. Giles’s explanation of the murder awes the viewer with whiplashes of emphasis and volume. “The second [Dontae] laid finger on the metal doorknob, a measly spark,” he says, with utter hatred for that spark, “turned into a raging fi-yah!” The actor, Beverly Hills entertainment lawyer Gildart Jackson, takes contagious pleasure in every syllable. He’s captivating in his willingness to dive so far into character. Contestants create a tone of B-movie dread that makes these shouting matches sizzle with surprise against viewers expecting to laugh. Last week their alliances seemed not to matter. This week, they do, and we have lots of fun watching contestants create their roles and then play them off each other. One benefit of fake contestants is that they’ve already developed a screen presence. Then the talking heads can function as character construction, while footage from challenge rounds reveals how their strategies work within the game. Over shots of him testing the door for dust in Dontae’s last known whereabouts, Geno says that he will participate when spoken to but will not volunteer his findings. When Ronnie and Lindsey (a.k.a. Kirsten Dunst) chatter away about the murder, Geno listens but does not contribute. He then seems to hide behind Lindsey’s splayed arms and pore over the killer’s empty medallion box while she trails off about something unimportant. And before they leave, Melina goes over the bullet points of their investigation. We see Geno look away, eyes flickering over the nightstand. “Kinda subtle, ABC!” Suddenly there is room to reward viewers for their close attention (“To a reality show?”) and create contestant intrigue beyond the complexity of actual people, who may or may not play their roles with such finesse. The setup of these investigations shows narrative depth as well. A shred of evidence has sunken into the scene of the crime, a pool too deep for contestants to reach into. Kam volunteers to hoist the dramatic weight by taking off his shirt and jumping into dead man’s water. 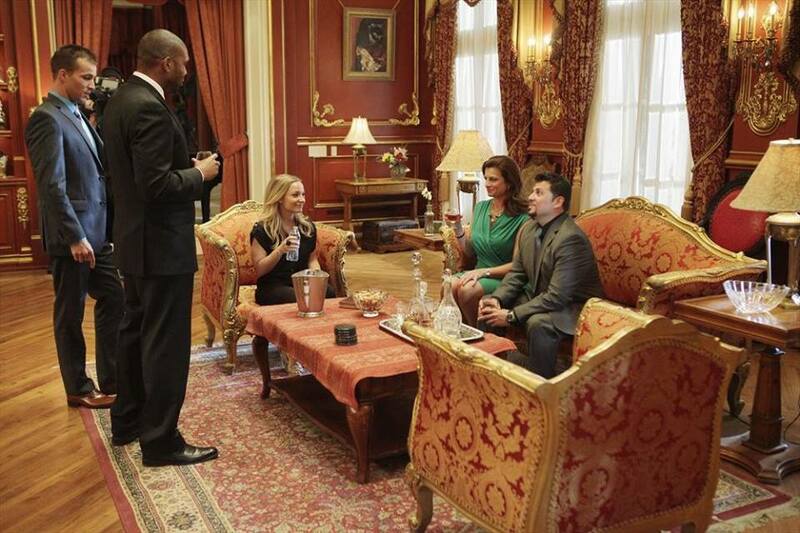 For the second challenge, characters search the mansion for clues pertaining to liquid fire. Ultimately, they have to open the cabinets in the laundry room to find a bottle of benzene pimped out with a death threat. With such a large area full of minute spaces to hide evidence, the sense of possibility and discovery is palpable, especially with other characters exercising their own logic at dead ends like the grills. We’re also jolted out of our detective hats when Kam grabs a doorknob upstairs and gets shocked. It’s startling because we’re not used to reality show contestants experiencing physical pain–especially pain intended by the creators (“How far will this show go?”). The “reality” of this booby-trap is thickened when Kam describes the path that the electricity took through his body. Character-wise, Whodunnit? also impresses. Ronnie comes back strong as the good-natured guy whose bounty hunting skills make him the best one to follow around a crime scene. He’s got a down-to-Earth charm as he explains the evidence: “It’s a lamp. It turns off, it turns on.” Retired-detective Don turns his lovability on its head in the morgue. He concludes that the killer made Dontae wear pajamas soaked in flammable liquid, before peeking through his grandfatherly veneer as a weary detective with road flares in his eyes: “Now let me ask you something,” he says. “Are we playing the game that no one else knows and we’re keeping this pat… or do you want to tell?” With character development to augment inventive murder details, Whodunnit? works on several levels at once. Don’s question gathers dramatic weight, too. While the former beauty queen Cris says they should only trade their information for more information, Good Man Ulysses looks unsure and says, in the safety of a character interview, “I feel like all the big pieces of evidence are in other people’s hands and I’m at the mercy of everyone else, whether or not they’re going to speak honestly.” We see him quiver with the conscience of a man who has never told a lie. Could there be a storyline about Ulysses’s fall from grace?